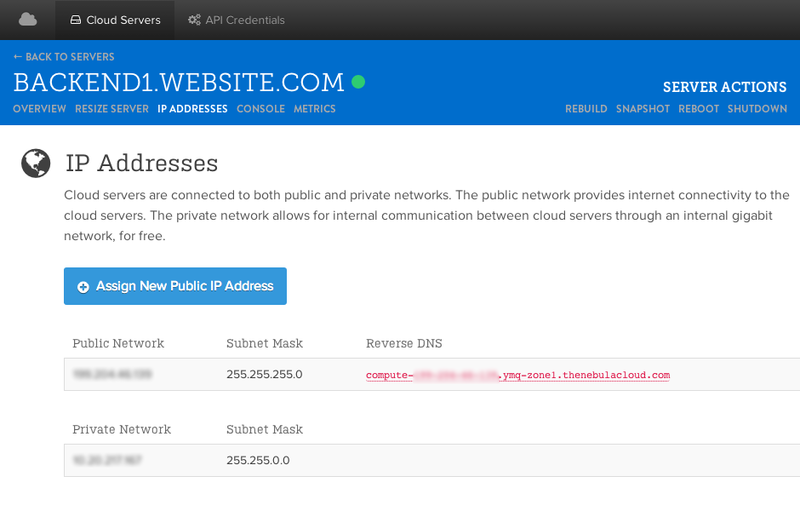 Today, we are introducing an updated version of our IP address management section inside our cloud control panel. It is now much faster, easier to use and it allows you to change the reverse DNS of the IP addresses associated to your server within a seconds. Cloud servers are connected to both public and private networks. The public network provides internet connectivity to the cloud servers. The private network allows for internal communication between cloud servers through an internal gigabit network, for free. We have gotten a lot of feedback regarding our control panel and we have been doing our best in implementing this feedback in the quickest period to make sure that we satisfy the need of all of our customers. We received a lot of input regarding reverse DNS so we decided to implement that. Now, you can change your reverse DNS by simply logging into your cloud control panel, clicking on the server you want to manage, then clicking on IP addresses. From there, you can see the reverse DNS for each IP and you can click on it and edit it right away from there. The changes are immediately sent to our DNS service for update and you should see the new updated reverse DNS within minutes. This feature will help customers who have email requirements to improve their delivery rates by adding a correct reverse DNS that matches their hostname. Most email servers on the Internet are configured to reject incoming emails from any IP addresses that do not have a reverse DNS record configured or if the server’s hostname does not match the reverse DNS. If your email is not fully rejected, it does get marked as a potential spam email, so it is best to setup reverse DNS for emails. Overall, we are very happy with the release of this new small yet very useful feature and we hope to continue to add new features that our customers enjoy. We have also just finished testing a very major upgrade in our system which we will release next week, which has to do with increased performance and speed. We will release more details next week, so stay tuned! If you are interested in reading our other blogs, you can find them on our website. Don’t forget to follow us on Twitter for news and announcements – @vexxhost.